Another week, another progress update from my bathroom renovation! 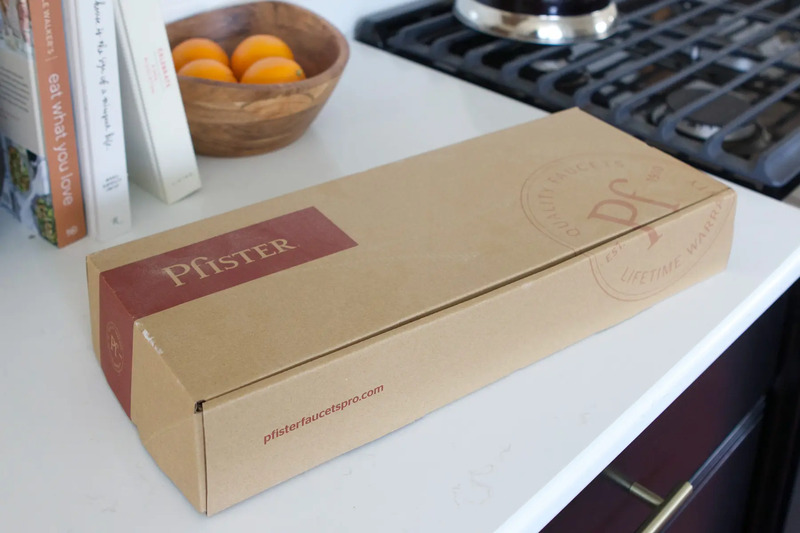 So far we’ve tackled the tile, the wood wall treatment, the paint and now we have a gorgeous new black faucet and a new vanity that I can’t wait to share! I have never dabbled in black fixtures before but after seeing what a statement the black cabinets make in our kitchen, which is connected to this half bath, I was eager to step outside of my comfort zone and try one! 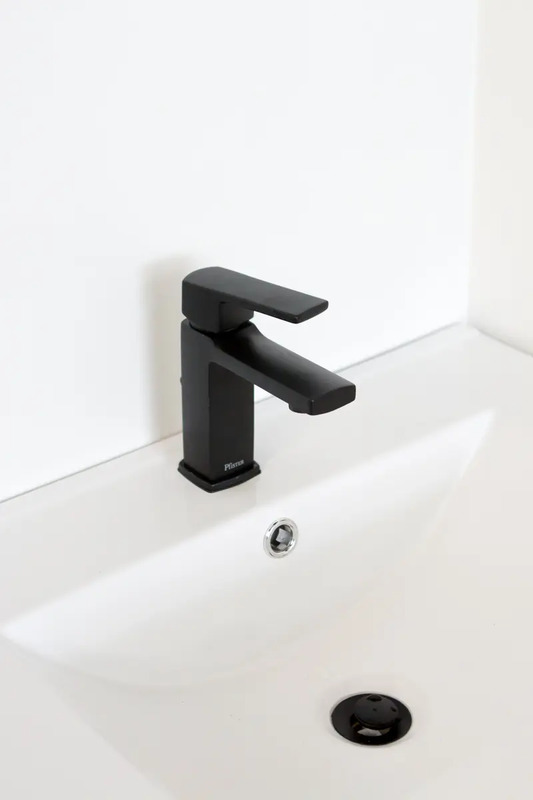 There is just something so handsome about a matte bold black faucet, isn’t there?! Casey has one in her bathroom and it’s so good! 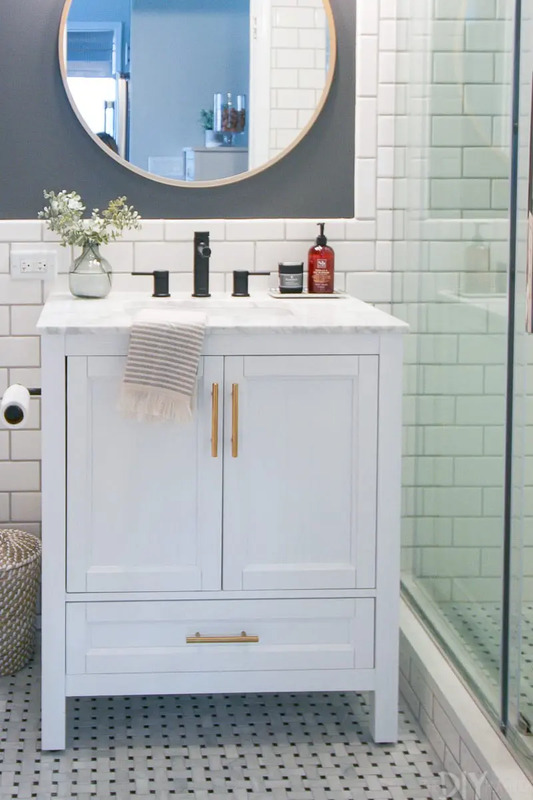 I have been seeing these gorgeous fixtures pop up more and more around the blogosphere and I’m loving the black detail. The only thing I had to keep in mind was that my vanity only had a single hole. 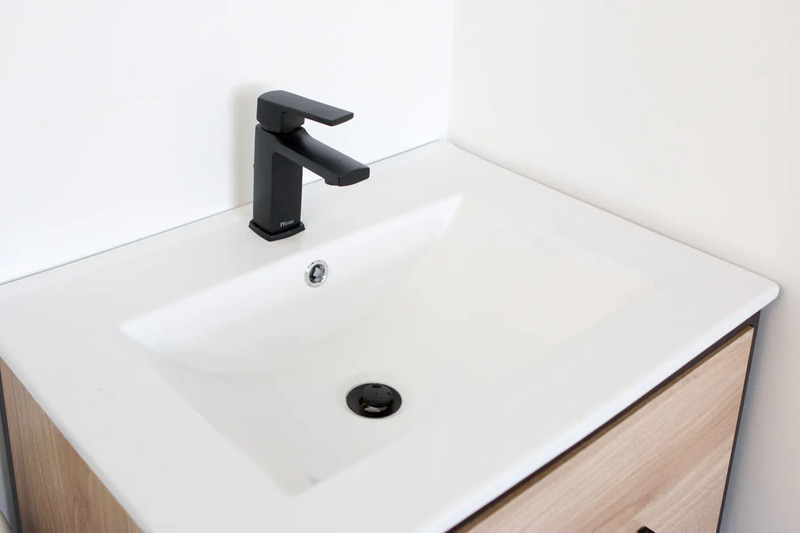 Therefore, when I started my search for a black bathroom faucet, I knew I needed to refine it to only single-hole faucets so it would be compatible with my vanity. I ended up choosing this one, but here are some of the other options that caught my eye! All of these were strong contenders because they are all equally handsome! Some readers have reached out since I shared this update on instaStories and asked about maintaining a black faucet. Does it show water stains more often? Is it harder to clean? 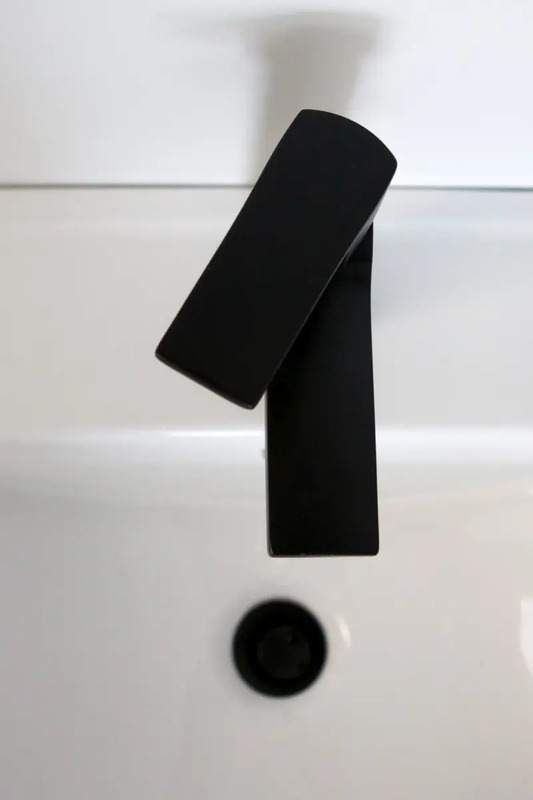 Living with a black faucet is new to me, but Casey reassured me that hers does not require any extra maintenance. She maintains it the exact same way as she would any other faucet (wiping it down with a wet rag). 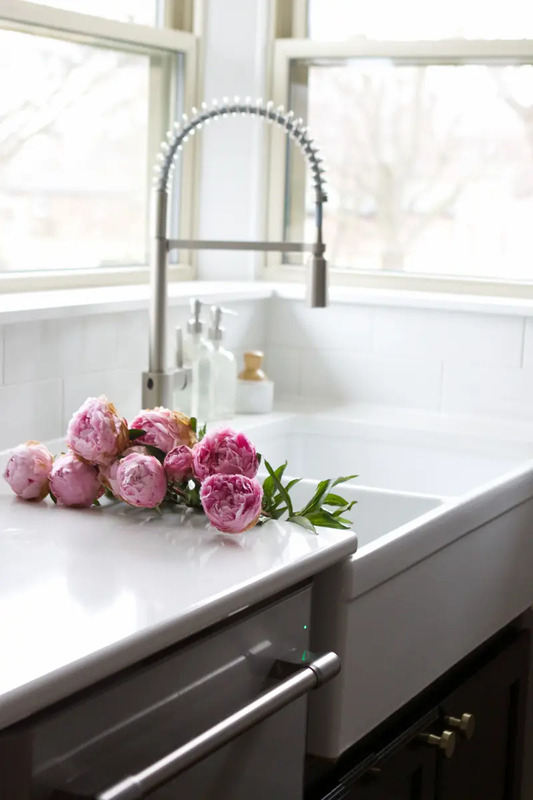 Plus, the good news for me is that this half bath is not one we use for brushing our teeth, so keeping the faucet and sink clean should be super easy! 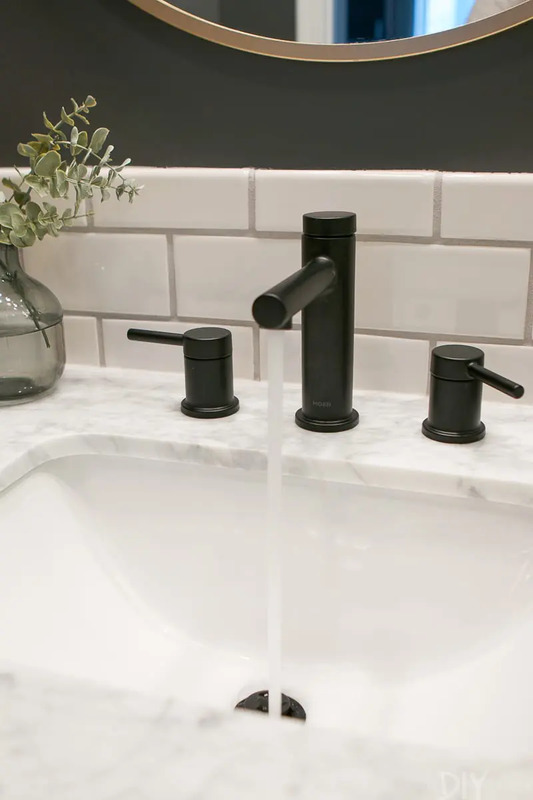 I love it the look of this new black faucet!! The single hole faucet fit perfectly in the pre-drilled vanity top. 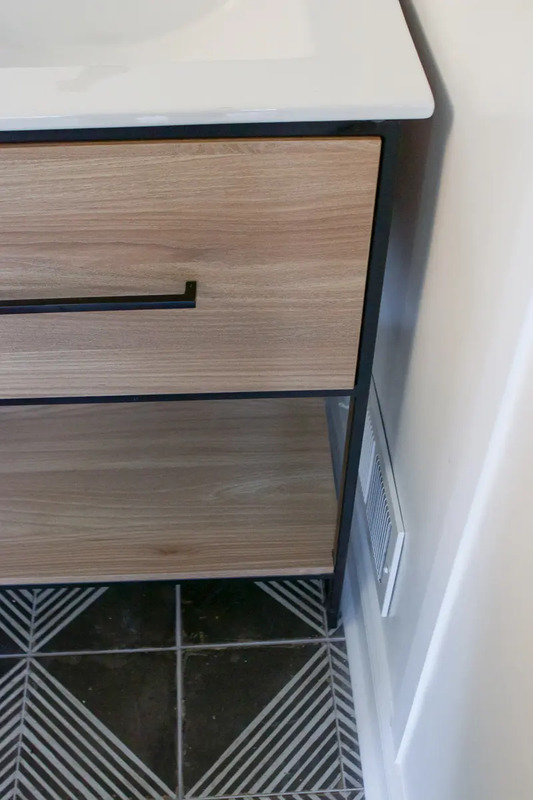 It also came with a black drain, which brings the look together nicely. I am going to pop out that chrome piece (where the overflow hole is) and spray paint it matte black to go with the rest of the faucet. Which brings me to a little dilemma I recently shared on InstaStories…the chrome pipes exposed under the sink. This bathroom is tiny so my options for a vanity were limited. 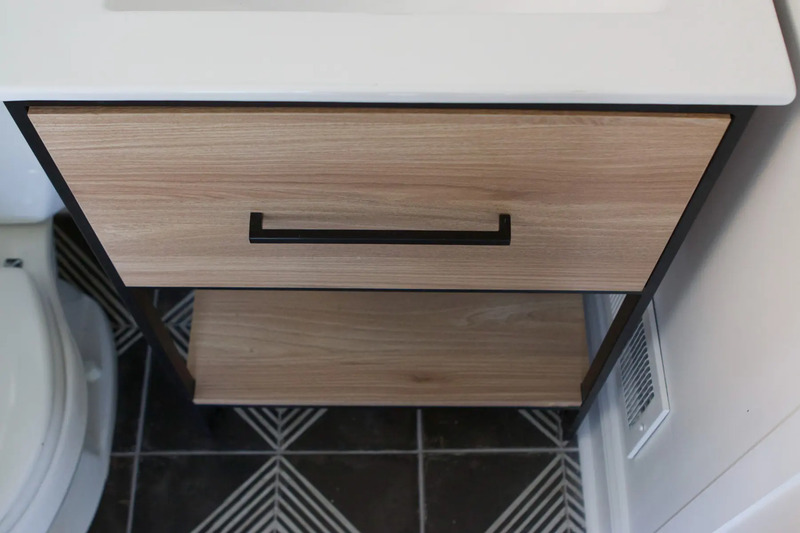 I absolutely love the 24″ vanity I ended up choosing (for under $300!) because I love the warm wood color it brings into the black and white space. I also love that it is open and airy, making the space feel just a little bigger than it really is. Plus, I really don’t have any storage needs in this tiny powder room, so an open vanity didn’t sacrifice any function for our family. Our old vanity was not open, which was fine EXCEPT for the fact that it completely covered the wall vent and prevented any circulation in the bathroom (not good). 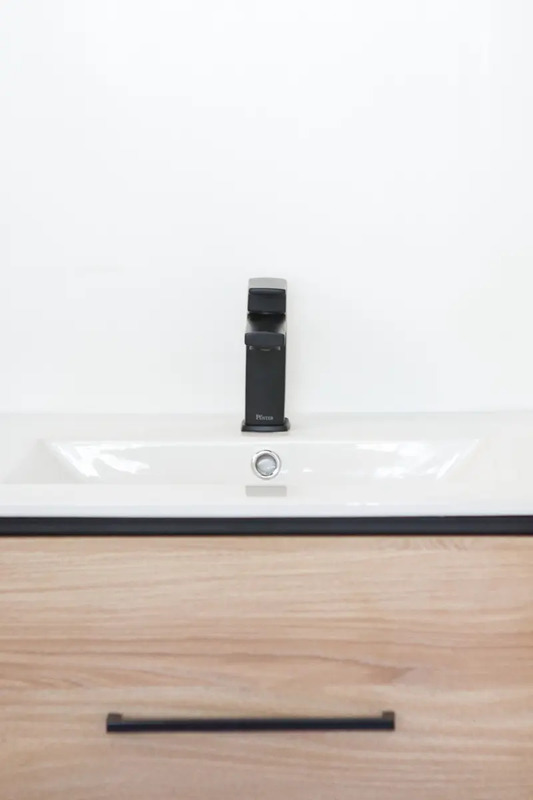 This open vanity option ensures that the vent is not impacted and the air can flow in this space effectively. 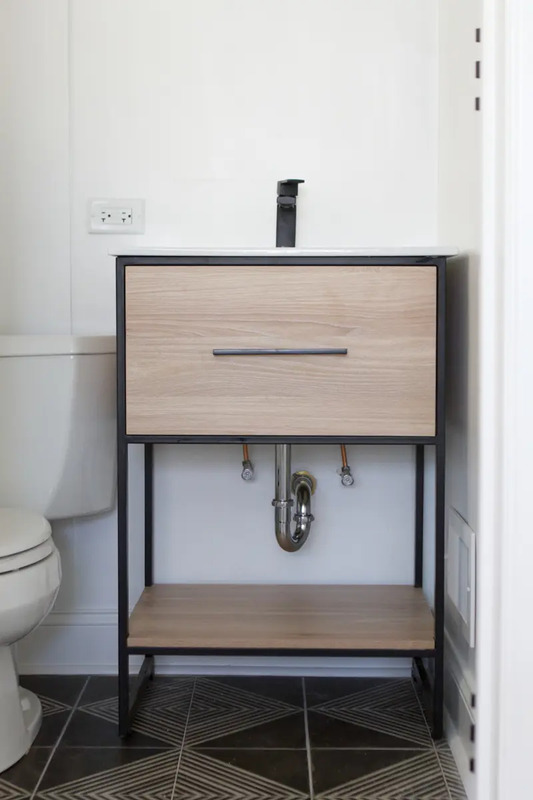 BUT, the open vanity bottom does mean that the pipes from the faucet are exposed. Right now the exposed pipes are chrome. I could keep them this way, spray paint them, or buy new ones. After polling our readers on Instagram, almost everyone voted to change the chrome to black! I could spray paint them, but I found a black PVC P-trap for $10 that I may get instead. I love a good spray paint job, but I’m not sure how well the paint would adhere to the pipe for the long haul. And for $10, I think I’ll make the investment and not have to touch it up ever again. That’s my tentative plan, at least… unless someone has a better idea! So outside of those few changes I have to make on the faucet/vanity, I’m almost done with this space! I have to hang the last few boards, prep/paint those, and then decide on all the final details (mirror, toilet paper holder, a few accessories to fill this tiny space). I also want to decide what to put on the bottom of the vanity. Of course, I can keep it open (to expose those soon-to-be black pipes!) or I could “style” that space. If I do fill up that space, I want the items to add some type of function. Yes, I could do towels… but is that weird since there’s no shower? Yes, I could do hand towels, but is that hotel-ish?! 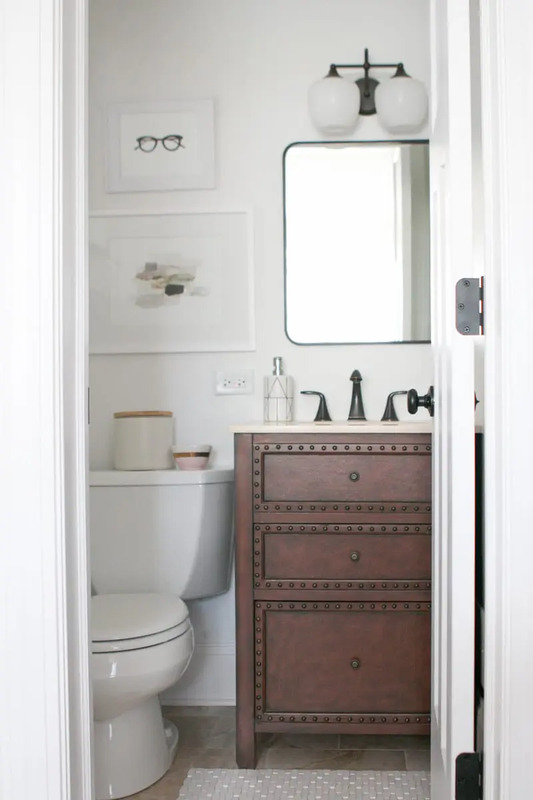 Who knew there’d be so many details to consider in such a tiny room?! My goal is to have everything done so I can finally reveal this room NEXT week. Hopefully, this means you won’t have to wait too long to find out what I’ve decided. 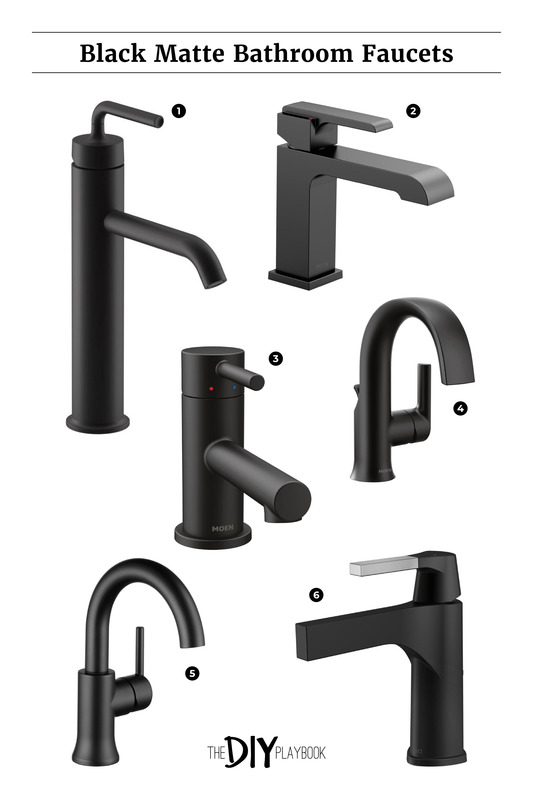 But until then, I’d love to hear your thoughts on this matte black faucet trend. Do you think these fixtures are as handsome as I do? Or would you prefer to stick with the traditional chrome in the bathroom? I’d love to hear your thoughts!